It has felt like an odd week- the Bank Holiday shortened the week, and last Monday was the finale of a week long arts music and drama festival in Sussex where I live. I mention this because of the 7 students from countries all over the world (South Korea, Ukraine, Spain, Germany, Belgium, France , and Poland) that helped with the events as volunteers through an organisation called Concordia. So they came here at their own expense to make connections, learn a bit more English, and to volunteer. They were simply brilliant young people. Back at work on Tuesday morning for a workshop between The Youth Consortium and Surrey CC’s Services for Young People management team. We were discussing the future of youth centres as buildings and places of service delivery. There are a number of options available to Surrey CC who wanted to ascertain what scope there was, if any, for continuing partnership with the Consortium. It was a positive meeting. Our CommUniLAB project continues to advance and we now have a plan to contact other corporates and to maximise the PR with our main sponsor. I’ve been working on the job profile for a Workforce development/HR part-time post which we will advertise shortly, and which will greatly strengthen our offer to member organisations. The seasons are noticeably changing – we wake up to thick mist in the fields in front of our house, which disperses in a flash. An in between time of transition..And this day next year will be a significant one for me. It’s been a great week: I have finished seeing 3 prospective Young Trustees (there is one vacancy on our Board) and all have a lot to contribute. I’m sure we’ll find a way to utilise all of their skills. Then a good meeting with Guildford College about developing our Workshops on self-employment/social enterprise (funded by Wates), now with a second day on financial management for business ( to be delivered by Barclays), plus a day on social media for marketing, so that there is a 3 day start-up package on offer. A passing comment to a senior colleague from Woking Borough Council also elicited interest from there. So we will be developing the current one day offer into a broader package for young people wanting to start –up, and marketing it in collaboration with partner organisations- Guildford College, and hopefully Woking BC. Which is great, for we have already been commended for our work on self-employment/social enterprise in the Government’s Positive for Youth Progress Report , published last month (see our website)…hence” Progress on all fronts”. National profile. Very positive meeting too about our Surrey Youth Enterprise social enterprise in Leatherhead - logo/branding sorted; I have to recruit first staff. Early sales are happening..hurrah! Meanwhile, I am drafting the job profile and ad for our new part-time Workforce Development and HR post which will go out in week commencing 2 Sept.
I’ve written a summary paper about Community Rights under the Localism Act, and have been slow to realise that we should be seeking the formal registration of all youth centres as “community assets” in the Community Asset Register that all local authorities are legally obliged to keep. The Youth Consortium and I have an important strategy day with Surrey CC Youth Service on Tuesday about long term strategy in the face of continued reductions in local government funding. ON a personal note on my day off last Friday I did walk 21 miles on the Sussex Downs in the rain..took 8 hours ..30 minutes off the pace on my benchmark time, but not bad for “pre-season”. Writiing sermon for service in beautiful village church in the Downs on Sunday. If you’re concerned by my austerity, please be re-assured that in this week’s arts an drama festival where I live, I have been to a bawdy “Poetry Pie and Pint” evening, a Picnic in the Park of a Grade 1 listed National Trust house/garden followed by folk in the church nearby. Tonight I’m off to the flics with eldest son…..”The Lone Ranger” (Johnny Depp etc). So a Hearty –High- Oh- Silver to you!! sorry it’s a bit like Jennifer’s diary. On Monday, I met the Deputy Police Crime Commissioner – these are now regular meetings. They are launching a cyber-bullying education campaign through Eagle Radio, who we also know well, and will join up with. We also discussed the fact that the Police make community grants of £400K, the High Sheriff Youth Awards are £60K, and the Youth small grants we are administering are £220K- the point is to identify the priorities of each so that maybe there could be some shared thinking, but not pooling of funds which would muddy accountability. On Tuesday, my Chairman and I visited the famous Woking Youth Arts Centre in Knaphill (famous because the Spice Girls first recorded there) to discuss a proposal from Surrey CC with the existing tenants (Peer Productions), that we become the managing agents for the property. This is a tricky matter, but for SYF and the voluntary sector it is a great opportunity for us to demonstrate our willingness and ability to undertake this property management role as agents. There will be a wider discussion to be had about the future of all the 31 youth centres – for there are options under the community right to bid (formerly buy)..joint venture companies and so on. On Wednesday, I met with the bank who are our founding sponsors and funders of CommUniLAB – the agreement is very nearly signed off, and the discussion was about building a longer term relationship. One of the ideas emerging was about linking our Wates funded work shop on How to set up in self- employment/social enterprise to a second day about business skills and financial management (delivered by bank colleagues) and a third day on marketing through social media. We intend to raise this as a package with Guildford College and the University of Creative Arts. A further creative idea was to create incubation centres (hot desks) where young people doing start –ups could access desk/internet /mentors and recommended suppliers of websites/graphics/printing and so on. We will explore this asap. We have articles in the Surrey Press about our successful work with BitC in finding volunteering days for them, and the wonderful Surrey Chamber are promoting our Growth Awards in their latest newsletter. Then I met a massively impressive 16 year old young student who is volunteering to join our Board of Trustees as a director, and so far we have 2 other young people who want to join the Board. We are delighted about the interest. So, a really positive week. And I have Friday off to walk 20 miles on the South Downs.....am reading 'The Life of Pi' as in the film, or 2002 Booker Prize.....bit behind....great story! An eclectic week with no real theme to it, but lots moving forward, and an interesting announcement to come in next week’s blog. First we have nearly signed off the Agreement with a national bank for them to fund and sponsor CommUniLAB for three years- this is the virtual learning network that brings together community organisations, universities, local authorities and business. So we will shortly be promoting it to other funders and then recruiting a manager to run it. We are very excited about it. I am meeting the Deputy Police Crime Commissioner about it on Monday. Secondly, the Surrey Youth Enterprise (social enterprise) is beginning to take off - key task today is to write job profile for first trainee who should be NEET currently, but be good with IT and must be willing to work/learn fast. Thirdly, wearing my Development adviser to The Youth Consortium, we are preparing for an awayday with Surrey CC about the future of youth centres and other matters. I have been approached by a potential Young Trustee – we are advertising a vacancy on our Board of Trustees/Directors to be filled by a young person. Alex has contacted me already, and we are meeting next week- others can still come forward. Then my Chairman, Chairman designate (tbc) and I had lunch on Wednesday with the Chairman of the County Council, who is one of our Patrons, and I am hopeful that SCC will sponsor one of our new “Surrey Youth Focus Awards for Business”. Finally, I have been working on a paper for an inner cabinet of Trustees about staffing matters. My aim is to ensure that the “decks are clear” for my successor in 2014, so that he/she spends minimum time on internal matters and maximises external focus. Busy few weeks in prospect at home – you know I am a Reader - lay preacher - in the Church of England, and 5 sermons to give over the next 6 weeks- but it is a privilege to do so. A quietish week by my standards but punctuated by a visit from an assessor from a grant-making trust to whom we have made a grant bid. It was challenging with good questions that put us on our mettle. We adjusted the bid which is to run a funding support service for our members in the light of his advice/comments. Fingers crossed. I am totally convinced we are a well organised, financially sound organisation that makes a difference to its members and hence young people. To ensure this is sustained, I have begun work on preparing for our next Pqasso submission (Practical quality assurance for small organisations) – bit like IIP or ISO 2001. Our current Level 1 award expires in November and Trustees have decided we should re-submit but at a higher standard – Level 2. Currently looking at staff roles, pay and contracts as part of this – and we need to adjust several things. I also visited my colleague in West Sussex Council for Voluntary Youth Services (with whom we have a MoU) to see if we could offer support to them (as discussed at our last Trustees’ meeting) as they are closing in September after 35 years of operation. I felt very sorry for my colleague Chief Exec. for organisational closure is I suspect like a bereavement. We agreed a way forward that will be helpful to both organisations. Regular readers will be aware that I think that we should stretch into Sussex but we probably “need to make haste slowly”, as one of my former bosses (in West Sussex County Council) used to say. Interest in our new website seems strong which is great – we have a new “Members only" section of the site which is where the Member benefits are located. We are linking with our friends in the Community Film Unit to commission a short explanatory film about us to go on the site. 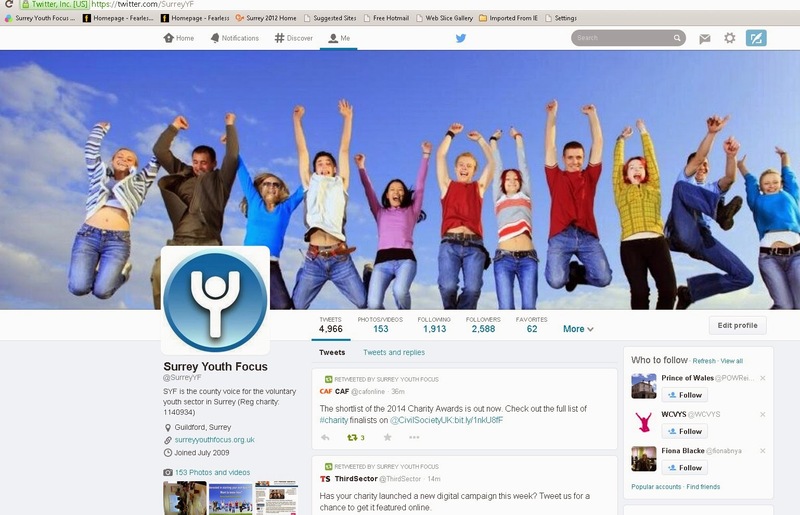 But maybe, the high point of the week was a directors meeting yesterday of the entirely separate Surrey Youth Enterprise CiC ( Community interest company), which also has made haste slowly, but now has an office, phones, computers, desks and, shortly, staff. SO the point is that after 3 years or so of development we will be trading – indeed the first sales are in the pipeline. Off to London on Saturday to have dinner at son no.2’s very fine restaurant called Magdalene in Tooley St. …post holiday food/alcohol reduction will go to ruin!